Far from the sprawling salt marshes and the low lying lands of Coastal Georgia, there is a place in the shadow of the Rocky Mountains that Abigail Norton once called home. A native of Colorado, Abigail grew up with a love of the outdoors and a passion for creativity. She moved to Savannah in 2002 to pursue a graduate degree, the next step in the dream of building a career in illustration. However after completing her degree, the life that she and her fiancé had begun to plan together would soon meet an unexpected obstacle when Abigail discovered a lump in her breast. Over the next several years, she would learn that some mountains are not meant to be climbed or drawn; they must simply be endured with a sense of humor, hope, and courage. “I was born and raised in Colorado. I grew up camping, fishing, sledding, tubing, and most things outdoors. I grew up with a big extended family… family is super important to me.” Art was something else that had always been a passion, and Abigail’s love of it would draw her to Pueblo, Colorado, where she would earn a bachelor’s degree in fine arts from Colorado State. She would take a year away from school before deciding to continue her education at the Savannah College of Art and Design. “I finished my degree in 2006. I was going to move up north to pursue an illustration career… but I met Jeremy Norton before that. We dated and were engaged in 2007…” The two planned a wedding for the following September, but only a handful of months before that, the couple would learn devastating news. “I found my lump myself. My then physician…sent me to Telfair Pavilion for a mammogram and to her fellow physician… who later became my breast surgeon. I was eventually diagnosed with stage 3 triple negative invasive ductal carcinoma. 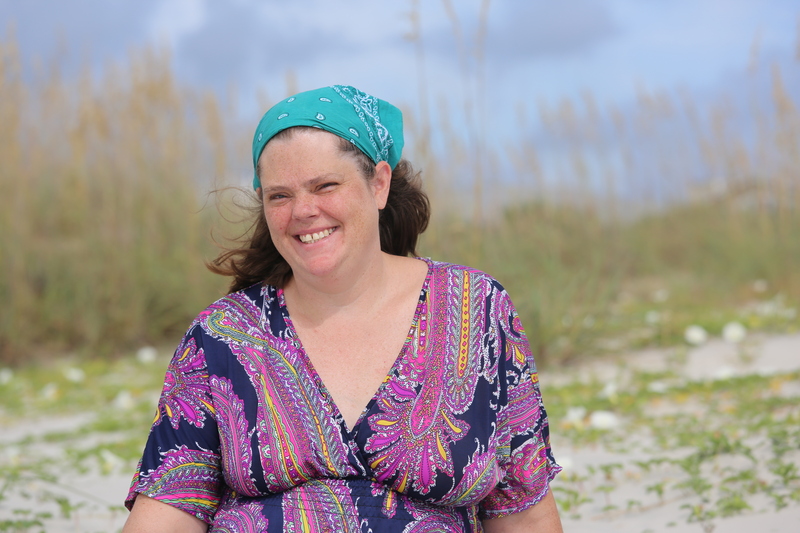 It was my thirtieth and a half birthday present to myself.” While it is routine for doctors to recommend annual mammograms for those over forty, Abigail’s story is a reminder that breast cancer can strike at any time. It is important for those of all ages to be aware of their breast health and perform regular self-exams. A battle with breast cancer is daunting and each person rises to the challenge in her own way. Some use anger to channel an inner-fighter, others dedicate themselves to becoming experts of the disease, while many draw deeper into their faith. How ever each survivor responds, the trait that seems most common among them is an unwavering sense of optimism. It takes courage to find funny in the frightening, the tenderness amongst the terrifying. When Abigail began to lose her hair, she and her friends found a way to make a joke about it, allowing her to laugh in a moment that makes many others cry. She remembers the pain of the treatments, sure, but she also remembers the warmth of seeing the six-foot, three-inch frame of her fiancé curled into a ball and sleeping on a tiny loveseat so that she would not have to be alone during chemotherapy. While the fight against breast cancer is a cause shared by many, it is ultimately a series of individual journeys that is each unique for the person and the families involved. Abigail knows this well, and she shares that sentiment in the advice that she gives to others who follow a path that she has traveled herself.